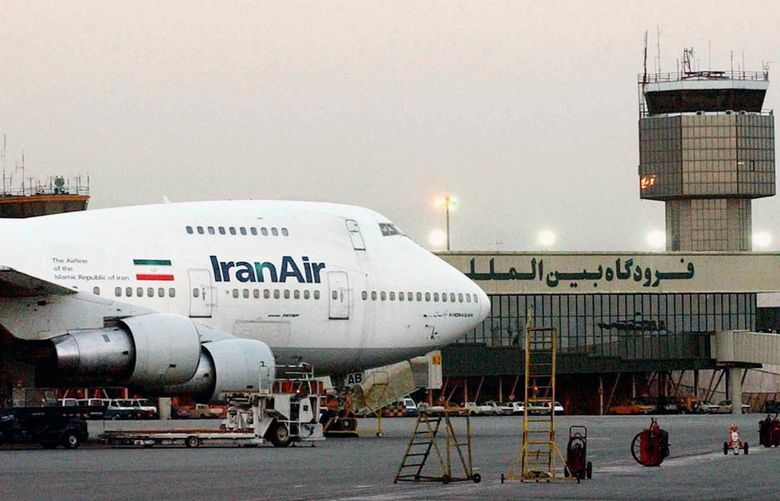 Boeing’s $8 billion order from Iran Air could be jeopardized if President Donald Trump’s declaration Friday reverses the slight thaw in dealings with Iran. If Boeing were to lose the entire order as relations deteriorate, the biggest hit would be to 777 production in Everett. Boeing has plenty at stake as President Donald Trump condemns — without actually renouncing — the Iran nuclear deal. Boeing has finalized one deal to sell 80 jets to Iran, worth an estimated $8 billion at standard prices, and it is negotiating others. Its discussions with Iranian officials are conducted under two U.S. government licenses, the first allowing Boeing to initiate sales conversations and the second a specific license to nail down details of the agreement to sell the 80 jets to Iran Air. That sale was finalized in December under the Obama administration, as was a parallel deal Airbus made with the same airline for 98 airplanes, plus another two jets sold indirectly. At the time, Boeing’s deal was the largest by an American company with Iran since the 1979 Iranian revolution and subsequent seizure of the U.S. Embassy there. Iran’s fleet of some 250 airliners is badly in need of modernization — most planes were purchased before the revolution, and its airlines have been prone to accidents. For Boeing and its archrival Airbus, that presents an immediate opportunity to win orders that could establish the nation’s airlines as long-term customers — if agreements aren’t torpedoed by political moves on either side. Trump said Friday he “cannot and will not” certify the Iran nuclear deal is in America’s national-security interests, but he won’t withdraw from the landmark 2015 accord or immediately reimpose sanctions. 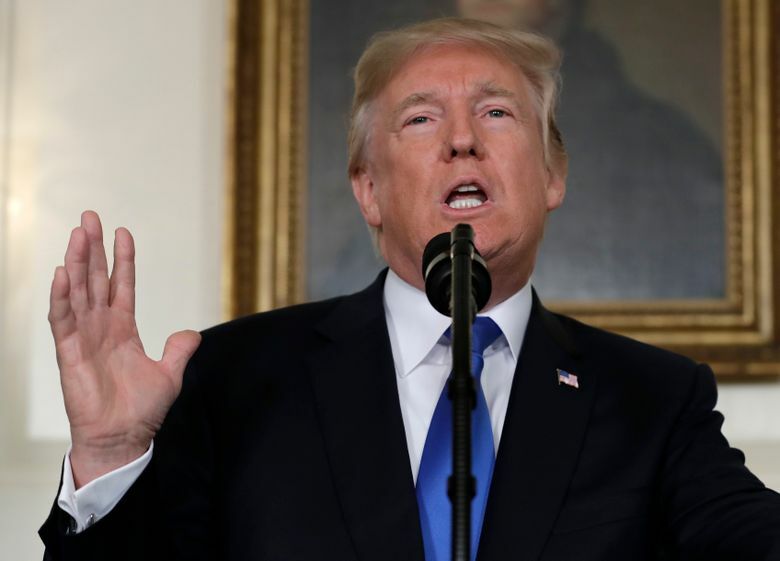 Noting Iran “is not living up to the spirit of the deal,” Trump also warned he would terminate the agreement unless its shortcomings are addressed. Trump is kicking the issue over to Congress, asking lawmakers to come up with legislation that would automatically reimpose sanctions should Iran cross any one of numerous nuclear and non-nuclear “trigger points,” Secretary of State Rex Tillerson and National Security Adviser H.R. McMaster said in remarks released before Trump’s announcement. Boeing’s Iran Air order — for 50 single-aisle 737 MAX 8s, 15 current model 777-300ER widebodies and 15 new model 777-9X widebodies, with deliveries supposed to begin next year — is worth about $8 billion after standard industry discounts, based on market-pricing data from aircraft-valuation firm Avitas. The Airbus order is worth about $8.7 billion. Both deals are considered firm orders in commercial terms, meaning that Iran Air paid the two jet manufacturers the required initial deposit, which is typically 1 percent of the total list price. For the Boeing order, that would be about $170 million. Airbus chose to book the sale at the end of 2016 and then rushed to deliver the first airplane, an A321, in January, just before Trump’s inauguration. Two A330s were subsequently delivered to Iran. Boeing, because of the political uncertainty around the purchase as Trump came into office, chose not to formally add the deal to its order book. That allowed Airbus to win the order race last year, outselling Boeing by 63 airplanes. Since then, both plane makers have continued to talk with Iranian airlines and have inked further tentative agreements. At the Paris Air Show in June, Boeing announced an agreement with Iran’s Aseman Airlines to buy 30 single-aisle 737 MAXes. Airbus announced agreements with Iran’s Airtour Airline to buy 45 single-aisle A320neos and with Zagros Airlines to buy 20 A320neos and eight widebody A330neos. If U.S. sanctions are reimposed, all these deals would be killed. Because Airbus jets contain more than 10 percent U.S. content, they too require a license from the U.S. Office of Foreign Asset Control to be sold internationally. The future of all these jet sales remains very unclear, however. The Iran nuclear deal specifically allowed Iran to unfreeze overseas financial assets and to buy commercial aircraft. If the deal is not killed completely, it’s even possible Congress could reintroduce limited sanctions that would leave intact the licenses to buy jets. The fact that Trump did not impose any sanctions “is definitely good for both Boeing and Airbus,” said Douglas Harned, a Bernstein analyst who tracks Boeing. Even without renewed sanctions, hurdles remain. Richard Aboulafia, an analyst with Teal Group, an aviation and defense consulting firm, said the Iranian airlines could yet have trouble financing their orders, partly because banks are unlikely to loan them money until Iran signs the Cape Town Agreement, an international treaty that includes provisions for repossessing capital assets like planes. If Boeing were to lose the entire order, the biggest hit would be to 777 production in Everett. Iran’s order for current model 777-300ERs would help fill a looming gap in production in 2019 that has already led Boeing to cut the 777 rate. And the 777-9X portion of the order would help solidify the prospects of that new airplane, due to start delivery in 2020. The current order book for that plane is heavily dependent on the three large Gulf carriers, all of which have seen growth falter in the past year. “We continue to follow the U.S. government’s lead in all our dealings with approved Iranian airlines,” Boeing said.